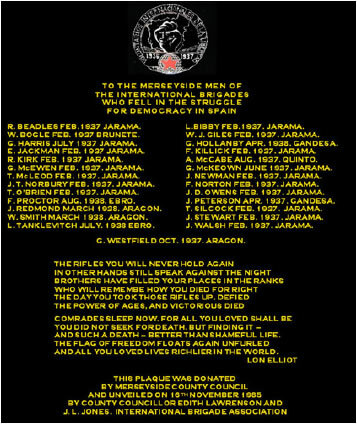 A plaque with the names of those from Merseyside who lost their lives fighting in the Spanish Civil War has found a permanent home in Liverpool. The memorial, with the names of 27 local people, has been unveiled at the Unite building in Islington. The city’s office block has been called Jack Jones in honour of the ardent trade unionist from Garston who was badly injured in the conflict. There were approximately 180 men and women who left the safety of Merseyside to defend the Spanish government against the might of General Francisco Franco’s nationalist rebels between 1936 and 1939. Jack Jones survived the war and became the leader of the Transport and General Workers’ Union. He was heavily involved with the unions until he died aged 96 in April last year. Local historian, Danny Payne, said that although there were 27 names on the plaque, after further research it is believed that 30 people from Merseyside died fighting. Jack Jones was christened James after James Larkin. For interesting stuff on Jack Jones and Larkin click here. We’ll be looking at Ken Loach’s film Land and Freedom which focuses on the Merseyside Volunteers who fought in the Spanish Civil War. It stars the Liverpool actor, Ian Hart.